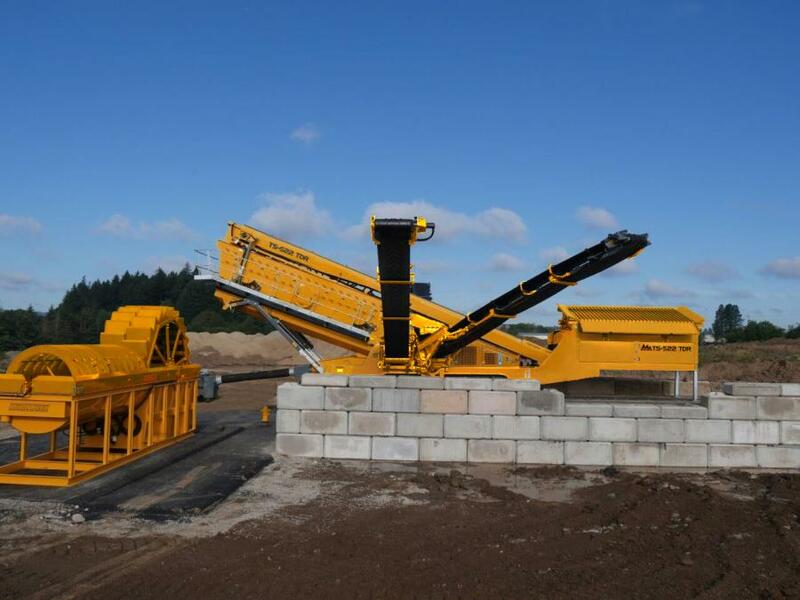 IROCK Crushers, a leader in global sales of mobile crushing and screening equipment, has redesigned its TS-522 TDR track portable screening plant to include a rinser. The portable unit gives mines and quarries the convenience to screen and wash materials, such as aggregates, simultaneously for end-use applications, including concrete and asphalt production. The machine sorts and washes as many as three sized and one oversized products at once, making it suitable for medium- to large-scale operations. The unit processes 200 to 300 tph and features three decks with nine spray bars along the top deck and eight each on the middle and bottom decks. The spray bars' durable brass heads deliver 25 psi of water pressure each to efficiently and effectively remove dirt and debris from material. Technicians can rotate the spray bars to change the angle that the water hits the material, which can be done to help hold aggregates on the screen longer or force it through the screen media. IROCK designed the TS-522 TDR to also include a rinse box at the top of the unit that features two additional spray bars. The spray bars pre-soak material to facilitate faster and easier removal of tough mud and clay as material reaches the screen decks. The rinser's 14-foot-wide hopper holds as much as 12 cubic yards of material. This provides ample space to accommodate a large amount of aggregates, resulting in optimal production rates. The unit's 320 square feet of screening area further contributes to the machine's high output while the two 22- by-5-foot decks and 20-by-5-foot bottom deck media can be changed, giving customers full control over end-product size. The TS-522 TDR's catch box can be lined with IROCK's optional wear-resistant rubber to withstand the abrasiveness of sand and water as it's captured during the screening process. The rubber liner can last several years, saving owners thousands in catch box repair and replacement costs. IROCK also designed the machine to power a small sand screw. The TS-522 TDR rinser box has discharge pipes for sorting as many as two different sizes of sand products for use in sellable materials, such as concrete and masonry sand, from the bottom deck. Hydraulically folding side conveyors allow for some of the highest stockpiling heights and capacities in its class today. The conveyors stack material as high as 16 feet, 8 inches on the sides. The high-stacking conveyors also provide the convenience of running the machine for long periods of time before needing to reposition finished material. The TS-522 TDR is 62 feet, 4 inches long and 9 feet, 10 inches wide. At only 12 feet high, it's safe and easy to transport on a trailer. Users can set up the unit in as little as 20 minutes thanks to hydraulically powered features, such as conveyors and easy-to-use controls. The rinser's tracks also allow for fast and easy maneuverability to position the machine when on site. A 129-horsepower Caterpillar C4.4 engine powers the TS-522 TDR to deliver high production rates. IROCK also offers additional features to enhance productivity even further and provide extra durability. A vibrating livehead, for example, replaces the standard grid over the hopper to screen material and loosen heavy, dirty and sticky debris from product before it enters the hopper. This expedites the screening process and boosts productivity. Catwalks alongside the screeners provide full access to each side of the screenbox for easy maintenance or screen replacements. IROCK offers convenient 24-hour online parts lookup and ordering, fast delivery and live service support 8 a.m. to 9 p.m. EST. For more information, visit www.irockcrushers.com.